Manchester United travel to Craven Cottage to play Fulham on Saturday but will, you suspect, have one eye on Paris Saint Germain, who come to Old Trafford three days later. Ole Gunnar Solskjaer, who claimed his ninth win in ten games as caretaker manager against Leicester City, faces the tricky task of fielding a team which can beat Fulham whilst preserving the fitness of a few players. It is a fine balancing act: overdo it and you are at risk of losing to Fulham; fielding a full-strength side, on the other hand, could result in a key player getting injured. With that in mind, here is an idea of how Man United could line up, with Diogo Dalot and Fred coming back in. 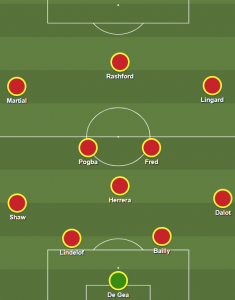 Inserting Fred – who has hardly played under Solskjaer – into the starting XI at the expense of Herrera does not work simply because United’s engine goes missing. The tenacious presence of the Spaniard is very important. Playing Herrera slightly deeper, inviting him to operate behind Fred, would surely give a better platform for the midfielder to succeed against a team United ought to dominate. Diogo Dalot likewise deserves another chance to get a taste of Premier League football – a move which hands Ashley Young the opportunity to rest ahead of a mammoth game which Solskjaer will need him to play in.